The RF Broadcaster is a electric component that sends out a signal at a frequency. It is possible to make a trap with the RF Broadcaster. 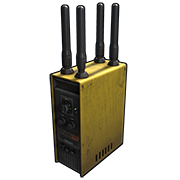 RF Broadcaster can't be wired with Audio Alarm, Door Controller, RF Broadcaster, SAM Site.